A couple of weeks ago, thieves stole gratings from gutters, one from here, one from there in at least three places. Anyone might have stepped off the kerb into watery and frightening discomfort or terrible pain. Having avoided the peril, my interest was trivial - there were ferns in there - ferns I would never have been aware of otherwise. Hopefully, we are coming to the end of rain and drizzle (alternating with shivering cold) and I’ll go back to clambering up and down no-longer-muddy banks and thrusting my camera confidently into non-wet bushes and under non-dripping leaves. In the short term - urban plants are getting more of a look-in. The surprise find of a fern-in-a-hole sent me to look in other drains and gutters and to search through old photos too. where there used to be a down-pipe. Like this. 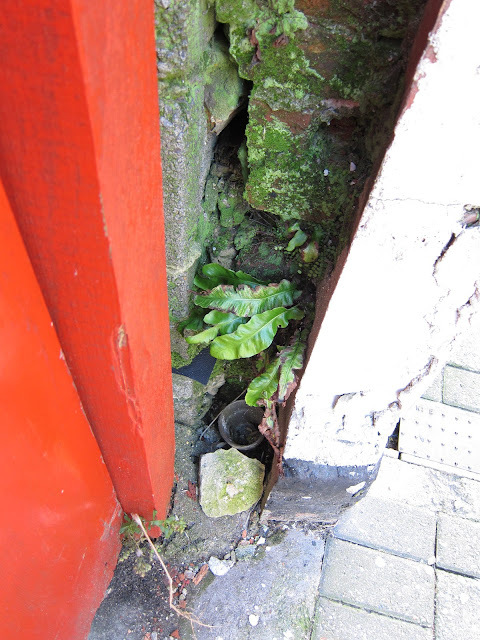 Here is a fern in the narrow space where a down-pipe used to be between a door and a pavement. On the buildings opposite, high up, a buddleia grows from a cluster of pipes. In January, gutters running with water have been keeping plants green. I’m surprised they haven’t turned to mush. There are times when they have been submerged by water rushing towards drains. Sagina Subulata (Irish Moss) (I think) Centre. Groundsel (Senecio vulgaris) to its left. Cleavers (Galium aparine) (top centre) with what appears to be some kind of squash sprout in front of it but probably isn't! Top right - some kind of dandelion style plant. There's also a seedling in front of the groundsel that looks more like onion than grass and could be a wild chive (Allium schoenoprasum). Come summer, I expect them still to be there when all moisture is gone, happily growing in these almost soil-less places. Not only that, many of them will be flowering. These are tough plants of extremes. Why are they not showered with more admiration? Mostly, they are simply trodden upon. A plant I don't like (how's that for science?) with Scarlet Pimpernel (Anagallis arvensis) (top left) (I think) and a Willow Herb (I think)(top right). It’s swinging between stormy sunshine and dullness today. This morning, sparrows were twittering energetically and a collar-dove was chuntering on . . . and on . . . It is half past two as I write. The sun has come out and the birds have mostly stopped. I can hear cars in the distance. A flock of racing pigeons is taking its exercise in circles against a blue-ing up sky. Hello Jack. In some places ferns are of great interest and you can buy these kinds in shops but here - they grow out of walls and in drains! I still like them though. Lucy, do you ever get some funny looks as you go about photographing drains and gutters? Hello Mark. I've put the name of the fern in the caption below the photo - Asplenium scolopendrium. I'm a bit concerned that the size of the typing in the captions is too small. I think, for gardeners, ferns may be awkward in that, given the right conditions, they thrive but giving them the right conditions isn't always easy. 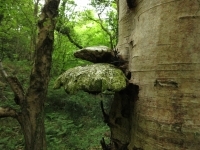 The Woodland Trust have a petition to save England's ancient woodlands (link on my blog); I signed that one as well! Mark - I forgot to answer your question about what people think when they see me photographing drains and gutters . . . Someone came out of their house when she saw me taking the photos of the gutter (irish moss and groundsel) and asked (suspiciously) what I was doing. People are sometimes a little challenging if I am photographing the ground near their homes. I don't know what the perceived danger might be! When I am taking photographs in a hedgerow, people often stop to talk. That can be time consuming. Then, when they ask what I'm taking a photograph of, they are generally bemused and disappointed when I show them a leaf or a twig. I think they are expecting me to say I've found a beautiful butterfly or a rare orchid. That the ordinary is interesting seems to be disconcerting. Hello Mag. Do the liverworts get overwhelming or is it that they indicate the soil needs attention? I know about the Woodland Trust petition (I receive Woodland Trust Emails) but I wasn't sure it would be right to sign two petitions about the same issue. Oh, Mark. Not doing well here. Did you mean the fern in the header? Don't know. Would like to be told! Hello Pat. The toughness of these plants reminds me how vulnerable we humans are. It's only because we have banded together as a society that we survive at all. Lucy - you will sympathise with me, if I tell you we once had a fern which had planted itself in the drainage pipe in a retaining wall. Our builder wanted to look at something, boot in convenient foothold. Goodbye fern, sob! Cool post and i liked it anyway. Great post, plants are such wonderful opportunists! We went to White Scar cave in Yorkshire once and while down there the guide got us all to stand still and turned the lights off just so we could see how utterly dark it was down there, it was amazing, but he also pointed out that on the cave wall a small plant was growing! Thanks for your visit to The Green Man and your lovely comment. Wishing you sunshine, bye for now! Many plants are remarkably resilient and grow in the most unexpected places. I'm always amazed at the number that grow among the railway tracks as you run into quite major stations - I'm thinking of Manchester here. The plant you don't like looks remarkably like a dandelion? I love them though not admittedly in my flowerbeds:) They are very useful herbs though and such sunshine-y flowers. Hello Diana. Was the fern contributing to the problem the builder needed to fix? It's something I'm not clear about. Buddleia destroys walls. Ivy can do the same if it gets its little feet into the mortar. But ferns . . . do they do damage? I wonder the same about Wallflowers. People plant both in their walls because they look nice but its hard to think why the roots of any plant would not cause problems. Hello Jennifer. Glad you like the post. Hope the fishing project is going well. Hello Dancin' Fool. That a plant can grow in the dark is quite breath taking. Have a good tree-time away. Looking forward to your posts when you return. Hello Rowan. The plant I don't like is definitely not a dandelion. (I like them a lot!) If it gets bigger (being in the road, that is uncertain - though probable)a moment will come when I will tell myself I'm an idiot . . . it's clearly a . . . so why did I not recognise it before? Hi Lucy - A lovely green, wet post. Ferns can be difficult to propagate and yet they pop up unassisted in the most uninspiring places. I'm always conscious about photographing other people's plots - in case they think I'm casing the joint. There could be a whole blog on "gutters and drains", not to mention ferns popping up. A fun read, and great photos. I see people cleaning out their gutters continously and it seems like a never ending job. But where would be be without leaves?? Even in the Rocky Mountains we get ferns in little cracks and crevices. 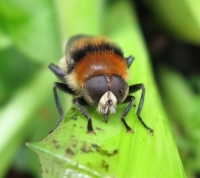 There are a few places they thrive in this cold climate, surprisingly! I haven't tried them in my garden yet. They seem to prefer deep shape. Love your photos! You are so creative! Hello Patio Patch. It's weird that, isn't it? - The way some plants can be prolific and tenacious as long as they chose their own place to live yet resist human attempts to tame them. About other people's gardens etc. - the tops of some houses can be seen in the first photo in the last post but it is rare that there are dwellings in my photos. I wouldn't photograph anyone's garden without permission. (Not that this is likely to come up because gardens are the not the focus of this blog.) However, I think public pavements and gutters are ok. I suppose people might wonder if I am about to swing the camera up and take a quick shot of their homes while I am there but I think that's it. I guess it's more that they feel uncomfortable to see anyone behaving oddly. If they ask what I'm doing, they are either disappointed or bemused. (Generally the former). Hello Janie. I'm resisting the temptation. I like blogging and agree the idea of one devoted to gutters and drains would be interesting as well as unusual! Hello Rosie. Thank you for the complement about the photos. Asplenium scolopendrium is common round here. It likes woodland (and drains!) but I know it also in a north facing wall where there is shadow rather than deep shade. What interests me too is that in wild places it accepts water running round it down banks but also grows in the dryness between bricks. It seems that seeds will sprout in the most amazing places. Is always great to see how life finds a way! "plant I don't like" label. I might make a ceramic tag with that on it for my garden, along with the more serious ones for "rosemary" and "hellebore." I can pass it around like a garden dunce cap. You have rain, we have snow and tons of it. Now, things are thawing and the sound of drip drip drip is making me very happy. What an interesting blog - and with detailed and fascinating observations. I am glad to have found you and look forward to returning.